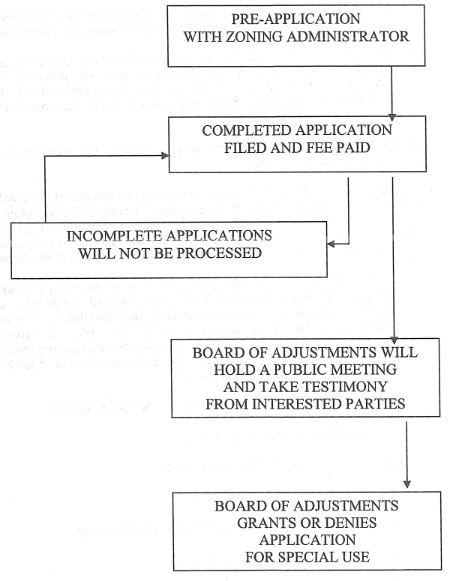 § 425.010 Procedures and Fees. § 425.020 Adoption of Subdivision Regulations. § 425.030 Board of Adjustment. Section 425.010 Procedures and Fees. Section 425.020 Adoption of Subdivision Regulations. Section 425.030 Board of Adjustment. Procedure. The purpose of this guide is to set forth a step-by-step procedure for the implementation and administration of the City's development regulations. Included are instructions for adopting and amending both the Zoning and Subdivision Regulations, as well as sample forms for each type of request that will be processed by the Zoning Administrator in day-to-day duties. State Statute controls the procedures to a great degree and thus it is important that this Section be reviewed and updated annually so that it remains in conformance with statutory requirements. For the purpose of the Zoning and Subdivision Regulations, the term "Commission" shall mean the Planning and Zoning Commission. For the purpose of the Zoning and Subdivision Regulations, the term "City" shall mean the City of Bolivar, Missouri. For the purpose of the Zoning and Subdivision Regulations, the term "Governing Body" shall mean the Board of Aldermen for the City of Bolivar, Missouri. The purpose of Zoning and Subdivision Regulations is not to unreasonably or arbitrarily limit or prohibit development, but to guide development in an orderly and coordinated manner so as to enhance the livability of the City and protect property values, all in the best interests of the public welfare and safety. These regulations do not unreasonably or arbitrarily restrict the development or use of property within the City, but they are intended to prevent development and use of property in a manner that would adversely affect adjacent property or that would be a detriment to the public welfare or safety. The degree or effectiveness of the zoning and subdivision regulations is defined upon the caliber of administration. The best regulations are ineffective in themselves and can only perform their function through proper application. In order for the regulations to be effective, they must be equitable and, in order to be equitable, they must be interpreted and administered in a fair and consistent manner. 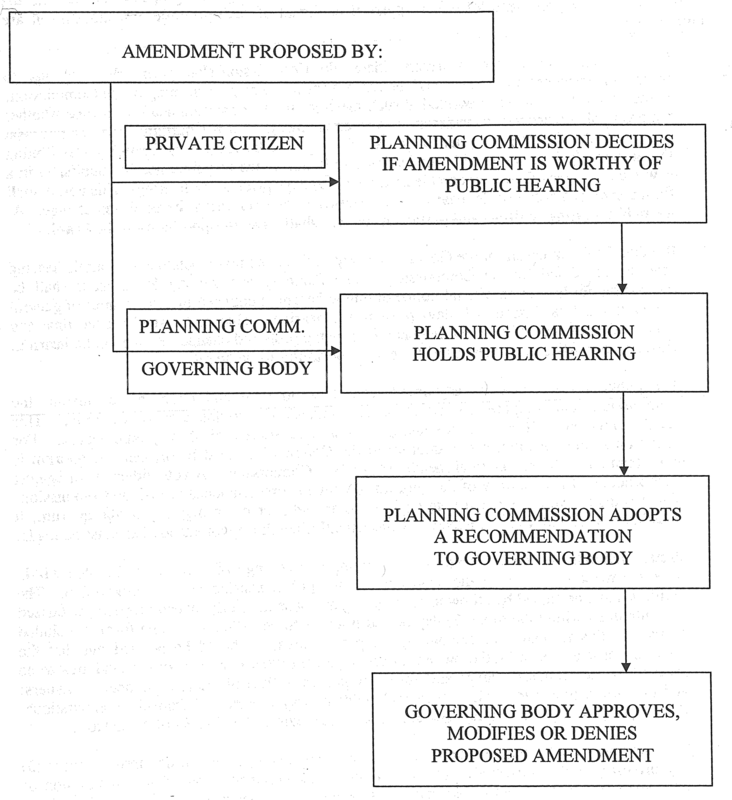 In setting forth these regulations, the Commission and the Governing Body have taken into consideration that one (1) extremely important function that the Planning and Zoning Department should perform is the preparation of reports on proposed zoning amendments, applications for zoning changes, variances, special uses, preliminary plats and other similar requests. 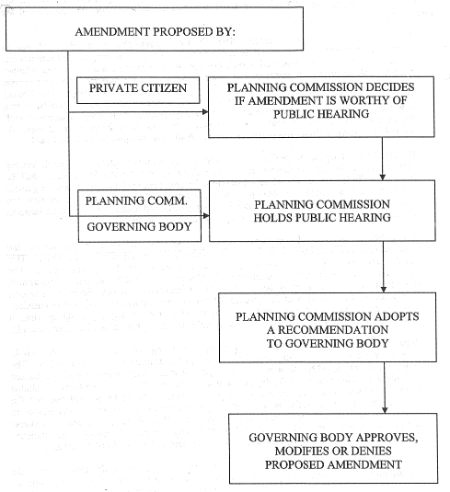 Providing for a process that helps the Planning and Zoning Department in presenting those facts necessary for determination in a concise manner (which is a large part of what these regulations are intended to do) will place the Commission and Governing Body in a better position to arrive at a determination when planning and zoning matters are placed before them. The Commission shall make or cause to be made surveys and studies of the existing conditions and probable future growth of the City and shall adopt a development and land use plan by resolution as a part of the City's Comprehensive Plan. This plan shall be prepared and adopted pursuant to the authority and restrictions of Sections 89.340 through 89.360, RSMo. (as now stated or as hereinafter amended), including the satisfaction of any public hearing requirements necessitated in compliance with said Statutes. The Commission shall study and review the proposed regulations and zoning districts and, upon completion of its review, shall make tentative recommendations based on the land use plan or the land use studies or surveys outlined above. The Commission shall hold a public hearing on the tentative recommendations. The Planning and Zoning Department shall be responsible for having a notice of public hearing published in a newspaper of general circulation in the City at least fifteen (15) days before the hearing. The notice shall fix the time and place for the hearing and shall describe in general terms the regulations and zoning district proposed. The public hearing may be adjourned from time to time and at the conclusion of the hearing, the Commission shall prepare its recommendations and, by an affirmative vote of the majority of all the members of the Commission, adopt them in the form of a proposed zoning regulation. The proposed regulation, together with an accurate written summary of the public hearing, shall be sent to the Governing Body of the City. The Governing Body may either approve the recommendations or approve with amendments by adoption of the zoning regulation or deny the recommendations. The zoning regulation shall define the boundaries of the zoning districts by description or by indicating the boundaries on a map incorporated and published as a part of the regulation or by providing for the incorporation by reference of an official map, which shall show the district boundaries. Such map shall be marked "Official Copy Incorporated by Ordinance No._________". The official Zoning Map shall be filed in the office of the City Clerk and shall be open to inspection by the public at all reasonable business hours. Zoning Text Amendment Procedure. Proposals for an amendment of the text of a zoning regulation are customarily initiated by either the Commission or the Governing Body. However, a private citizen may also begin the amendment process by submitting the proposed change to the Commission. The procedure for either approval or denial of such proposals for amendment are outlined below. If the change is initiated by a private citizen, the Commission shall permit the individual to present the proposed amendment and the reasons for it at a regular meeting of the Commission. Based on the information presented at such meeting, the Commission shall determine whether the proposal is worthy of consideration as an amendment. 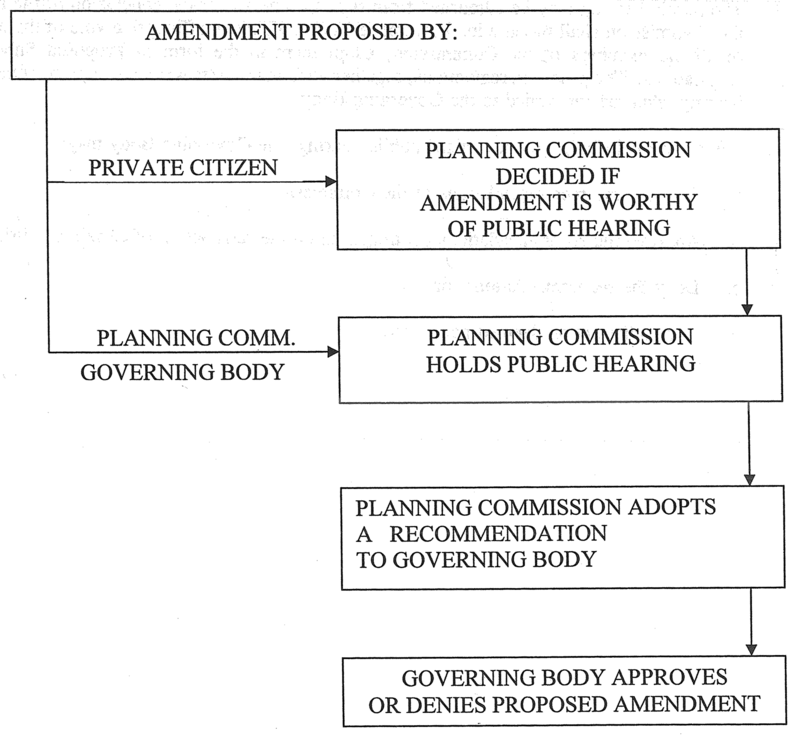 If it is determined that the proposal has merit, the Commission shall set a date for a public hearing. The Planning and Zoning Department shall be responsible for having an official notice of public hearing published in a newspaper of general circulation at least fifteen (15) days prior to the hearing. This notice shall fix the time and place of the hearing and describe in general terms the proposed change. At the public hearing, citizens and parties of interest shall have an opportunity to be heard. If either the Commission or the Governing Body initiates the text amendment, a public hearing shall be scheduled by the Commission. The Planning and Zoning Department shall be responsible for having an official notice of public hearing published in a newspaper of general circulation at least fifteen (15) days prior to the hearing. This notice shall fix the time and place of the hearing and describe in general terms the proposed change. At the public hearing, citizens and parties of interest shall have an opportunity to be heard. The public hearing may be adjourned from time to time and upon its conclusion, the Commission shall prepare and adopt its recommendation to the Governing Body. This recommendation shall be submitted along with an accurate record of the public hearing. 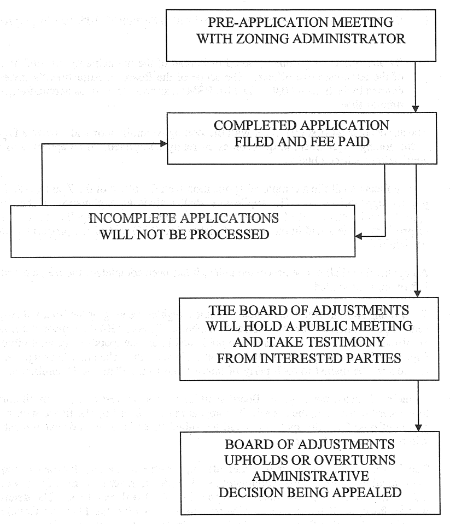 For action on zoning amendments, a quorum of the Commission must be present. A quorum is more than one-half (½) the total membership of the Commission. A vote either for or against an amendment by a majority of the quorum constitutes a recommendation of the Commission. When neither a vote for nor a vote against the amendment has a majority of the quorum, it constitutes a "failure to recommend". Consequently, another recommendation must be made. Protest petitions will be available in the planning and zoning office and must be filed within three (3) working days after the conclusion of the public hearing by the Commission. The petitions must be signed by all owners, including a spouse in jointly owned property, notarized and submitted within the three (3) day period in order to be valid. A sample form is included as part of this manual. In computing the protest area, it should be pointed out that the requirement is a protest by the owners of thirty percent (30%) or more of the land area to be affected by the proposed change and not thirty percent (30%) of the total number of owners; and that area devoted to public streets and rights-of-way is excluded from the computations. 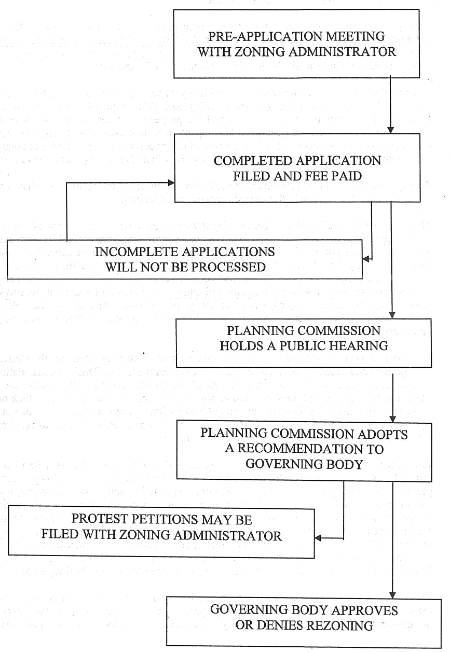 Protests or proposed zoning changes are allowed pursuant to Section 89.060, RSMo. The Governing Body shall consider the proposed amendment, although not until the three (3) day protest period has expired, and may approve the recommendation of the Commission or take whatever action it deems necessary. If an adequate number of protest petitions have been filed, the change can be approved only by at least a two-thirds (2/3) vote of all the members of the Governing Body pursuant to Section 89.060, RSMo. If the Governing Body approves the requested change, it shall adopt an ordinance to that effect. 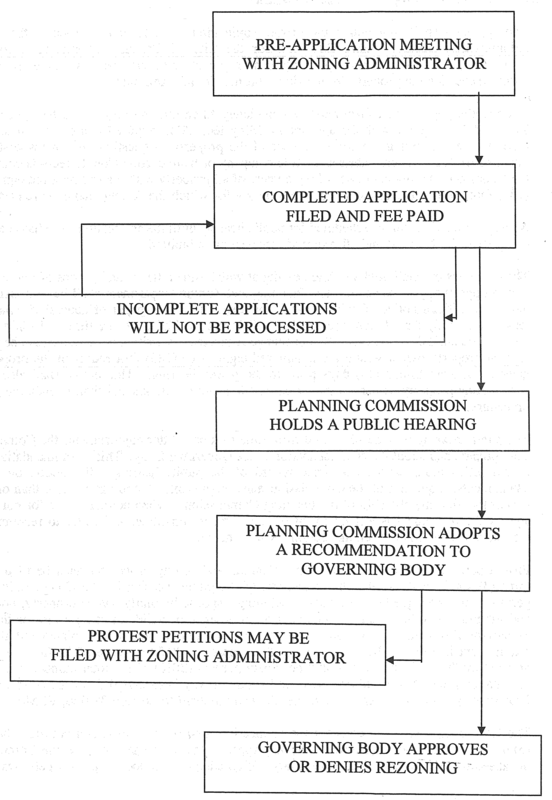 Zoning District Change Procedure. The Governing Body, Commission or the owner of the property affected may initiate a proposal to rezone a district. The applicant shall first obtain the proper application form from the office of the Zoning Administrator (located within City Hall for the City of Bolivar) and receive a complete explanation of its requirements. The applicant may wish to discuss various zoning options and requirements for the property in question with the Zoning Administrator. Editor's Note — The Application for Rezoning form is included as an attachment to this chapter. The rezoning application form must be completely filled out and returned to the office of the Zoning Administrator with the appropriate filing fee. Also required is a copy of a recorded warranty deed showing the current owner of the property in question and an ownership list obtained from a registered abstractor, title company or from current County records containing the names and mailing addresses of the owners of all property within a one hundred eighty-five (185) foot radius of, and including, the property for which the zoning change is requested. An application shall not be scheduled for public hearing until the application form has been fully completed, the fee paid and all required information submitted. The Commission shall hold a public hearing at which time citizens and parties of interest shall have a opportunity to be heard. The Planning and Zoning Department shall be responsible for having an official notice of public hearing published in a newspaper of general circulation at least fifteen (15) days before the hearing. This notice shall state the time and place of the hearing and shall describe generally the change requested. A written notice shall also be mailed to each property owner within a one hundred eighty-five (185) foot radius of the property in question at least fifteen (15) days prior to the public hearing. This notice shall also notify surrounding property owners of their right to file protest petitions and shall explain the protest procedure. Editor's Note — The Public Hearing Notice form is included as an attachment to this chapter. The public hearing may be adjourned from time to time. After adjournment, the Commission shall prepare and adopt its recommendation to the Governing Body. This recommendation shall be submitted along with an accurate record of the public hearing. For action on zoning amendments, a quorum of the Commission must be present. A quorum is more than one-half (½) of the total membership of the Planning Commission. When neither a vote for nor a vote against the rezoning has a majority of the quorum, it constitutes a "failure to recommend". Consequently, another recommendation must be made. Editor's Note — The Instructions for City Protest Petitions and Petition form are included as an attachment to this chapter. The Governing Body shall consider the application for rezoning, although not until the three (3) day protest period has expired, and may approve the recommendation of the Commission or take whatever action it deems necessary. If an adequate number of protest petitions have been filed, the change can be approved only by as least a two-thirds (2/3) vote of all the members of Governing Body pursuant to Section 89.060, RSMo. If the Governing Body approves the requested change, it shall adopt an ordinance to that effect. If the official Zoning Map has been adopted by reference, the amending ordinance shall define the change of boundary and shall order the official Zoning Map to be similarly amended. The Planning and Zoning Commission shall prepare or cause to be prepared a set of proposed regulations governing the subdivision of land. The Commission may also prepare proposed amendments to such regulations when required. After preparing the proposed regulations governing the subdivision of land (or proposed amendments thereto), the Commission shall hold a public hearing on the proposed subdivision regulations (or any subsequent amendments thereto). The Secretary of the Commission shall be responsible for having a notice of the public hearing published in a newspaper of general circulation in the City at least fifteen (15) days before the hearing. The notice shall fix the time and place for the hearing and shall describe in general terms the regulations proposed. The public hearing may be adjourned from time to time and at the conclusion of the hearing, the Commission shall prepare its recommendations and, by an affirmative vote of the majority of all the members of the Commission, adopt them in the form of Proposed Subdivision Regulations. The proposed regulations, together with an accurate written summary of the public hearing, shall be forwarded to the Governing Body. Take other action deemed necessary. Subdivision Regulations Amendment Procedure. Proposals for an amendment of the text of the Subdivision Regulations are customarily initiated by either the Commission or the Governing Body. However, a private citizen may initiate the amendment process by submitting a proposed change to the Commission. The procedures for either approval or denial of such proposals are outlined below. If a private citizen requests the change, the Commission shall permit the individual to present the proposed amendment and the reasons for it at a regular meeting of the Commission. Based on the information presented at the meeting, the Commission shall determine whether the proposal is worthy of consideration as an amendment. 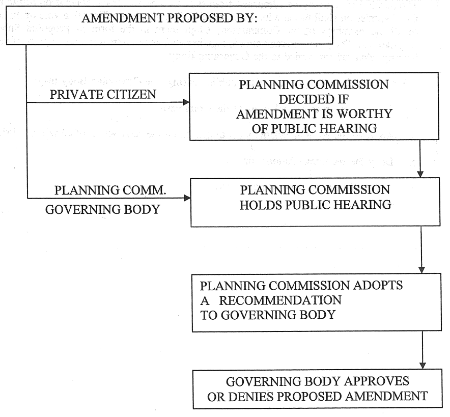 If it is determined that the proposal has merit, the Commission shall set a date for the public hearing. The Planning and Zoning Department shall be responsible for having an official notice of public hearing published in a newspaper of general circulation at least fifteen (15) days prior to the hearing. This notice shall fix the time and place of the hearing and describe in general terms the proposed change. At the public hearing, citizens and parties of interest shall have an opportunity to be heard. If either the Commission or the Governing Body initiates the text amendment, a public hearing shall be scheduled by the Commission. The Planning and Zoning Department shall be responsible for having an official notice of public hearing published in a newspaper of general circulation of least fifteen (15) days prior to the hearing. This notice shall fix the time and place of the hearing and describe in general terms the proposed change. At the public hearing, citizens and parties of interest shall have an opportunity to be heard. The public hearing may be adjourned from time to time and upon its conclusion, the Commission shall prepare and adopt its recommendation to the Governing Body. This recommendation shall be submitted along with an accurate record of the public hearing. For action on subdivision amendments, a quorum of the Commission must be present. A quorum is more than one-half (½) the total membership of the Commission. A vote either for or against an amendment by a majority of the quorum constitutes a recommendation of the Commission. When neither a vote for nor a vote against the amendment has a majority of the quorum, it constitutes a "failure to recommend". Consequently, another recommendation must be made. Take other action deemed appropriate. 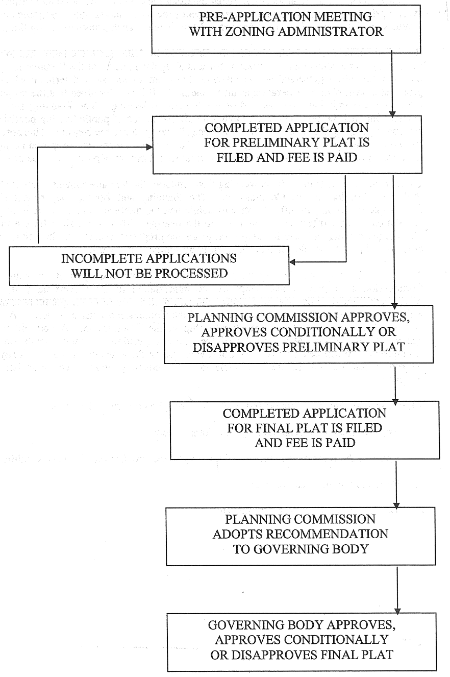 Preliminary And Final Plat Approval Procedure. All subdivision of land within the jurisdiction of the Subdivision Regulations must follow the procedures outlined below with certain exceptions. Any change of boundary that does not create an additional lot or any division of land for agricultural purposes into parcels of five (5) acres or more and does not create the need for a new street is exempt from the Subdivision Regulations. The applicant shall meet with the Zoning Administrator and receive an explanation for the subdivision procedure and its requirements, information on the current zoning of the property in question and an application form for subdivision plat approval. Editor's Note — The Application for Preliminary Plat form is included as an attachment to this chapter. The application form shall be completely filled out and returned to the office of the Zoning Administrator, along with the appropriate filing fee and any required supplemental information. The materials outlined above must be received by the office of the Zoning Administrator no later than twenty (20) days before the next Planning and Zoning Commission meeting in which the applicant would like approval of the plat to be considered. As a part of the application, thirteen (13) copies of a preliminary plat conforming to the requirements of the Subdivision Regulations and a vicinity map showing the location of the proposed subdivision are required. An application shall not be processed until it has been fully completed, the appropriate fee paid and all required information submitted according to the deadlines of the Planning and Zoning Department. Editor's Note — The Preliminary Plat Checklist is included as an attachment to this chapter. The Planning Commission, based on the standards set out in the Subdivision Regulations, may approve, approve conditionally or disapprove the preliminary plat. Upon approval or conditional approval of the preliminary plat, the applicant shall submit the final plat application form, along with the appropriate fee and any required supplemental information. Included as part of the application shall be the original plat, thirteen (13) copies of the final plat plus one (1) reduced copy (11x14) prepared in accordance with the Subdivision Regulations. In addition, two (2) copies of the constructions plans shall be submitted with the final plat application. Editor's Note — The Application for Final Plat form is included as an attachment to this chapter. Editor's Note — The Final Plat Checklist is included as an attachment to this chapter. The Planning Commission shall review the final plat and based on the approved preliminary plat and the standards set out in the Subdivision Regulations, adopt a recommendation to the Governing Body for approval, approval with conditions or denial. A recommendation must be made by a majority of the quorum of the Commission. Take other action as deemed appropriate. Editor's Note — The Application for a Lot Split form, which followed this section, is included as an attachment to this chapter. Authority And Limitations. The Board of Adjustment is composed of a group of five (5) citizens appointed by the Mayor and approved by the Governing Body. The Planning and Zoning Department shall keep all minutes and records of the Board's actions. To hear and decide all matters referred to it or upon which it is required to pass under such ordinance. The Board of Adjustment is a judicial body. If they deem it necessary, they may call in witnesses or subpoena evidence to aid them in making their decision. They may not act in an "arbitrary or capricious" manner, meaning that their decisions must be consistent and based on sound reasoning. Decisions of the Board of Adjustment are subject to review in the Circuit Court of the County where the City is located. Appeal Of Administrative Decision (Interpretation). By any officer, department, board or bureau of the municipality affected by any decision of the administrative officer. The scope of the Board of Adjustment's review will be as defined in Sections 89.080 — 89.110, RSMo., as now stated or as hereinafter amended from time to time. The applicant shall first (1st) meet with the Zoning Administrator and receive a full explanation of the zoning requirement in question as currently interpreted. If an appeal is to be made, an application shall be obtained. Editor's Note — The Application for Appeal form is included as an attachment to this chapter. The applicant shall file a completed application with the office of the Zoning Administrator and pay the appropriate fee. The application shall include an explanation of the decision being appealed and a statement of the reasons for the appeal. Where applicable, drawings or a list of property owners within one hundred eighty-five (185) feet of the property in question may be required. An application shall not be processed unless it has been completed, the fee paid and all required information submitted. The Zoning Administrator shall then schedule a regular meeting of the Board of Adjustment and send copies of the application to Board members. Twenty (20) days prior the Board meeting, an official notice to the public shall be published in an newspaper of general circulation in the City explaining the appeal and the time and place of the scheduled hearing. A copy of the notice shall be mailed to each party of interest and to the Planning Commission. At their scheduled meeting, the Board shall hear facts and testimony from all parties wishing to be heard concerning the appeal. The appeal must be heard by the Board within a reasonable period of time from the application and fee submittal and a written decision must be rendered without unreasonable delay. 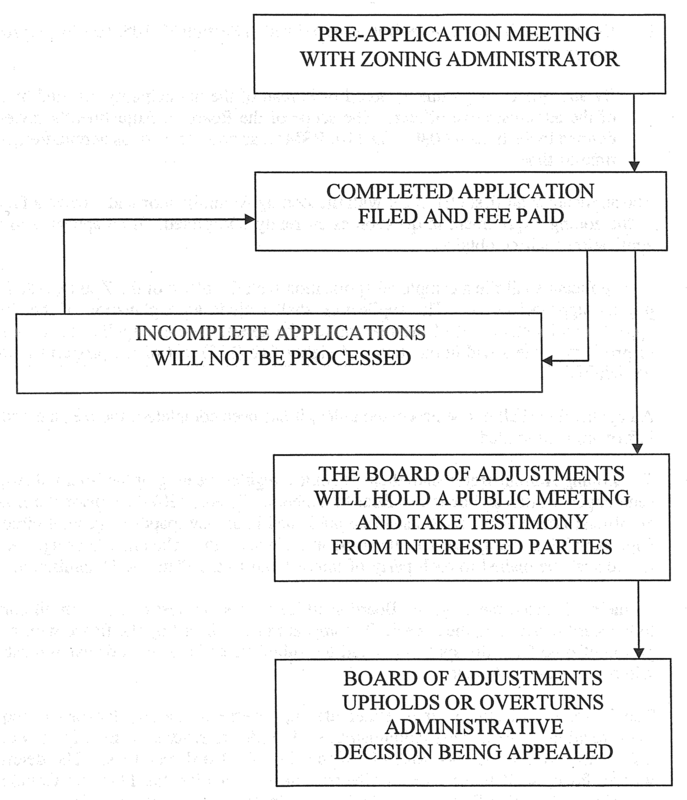 The Board of Adjustment may either affirm, reverse or modify the order, requirement or interpretation of the Zoning Administrator. In order to reverse or modify, however, requires a favorable vote of at least four (4) of the five (5) Board members. The determination, in written form, shall be sent to all affected parties including the Planning Commission. The Planning and Zoning Department shall keep minutes of the public meeting including evidence presented during the proceedings and the findings of the Board. Editor's Note — The Board of Adjustment Determination form is included as an attachment to this chapter. When an applicant feels that the strict application of the requirements of the zoning regulations would create an undue hardship upon him, he/she may request a variance from these requirements from the Board of Adjustment. The Board must base its decision on factual evidence and not the personal opinion of the applicant, neighbors or others. The request for a variance shall be based on a conflict between the restrictions on the development of the property due to the zoning regulations and the restrictions on the development of the property due to its physical characteristics. A variance shall be issued only to the specific restrictions on physical construction and not to the list of permissible land uses within a given zone. The applicant shall first meet with the Zoning Administrator and receive a complete explanation of the zoning requirements in question, the variance procedure and an application form. The applicant shall submit a completed application form and pay the appropriate fee. As a part of the application, two (2) copies of a sketch map shall be submitted showing proposed and existing structures and uses on the property for which the variance is being requested and on immediately adjacent properties. A list of property owners within one hundred eighty-five (185) feet of the property in question is also required. An application shall not be scheduled for public hearing until the application form it has be fully completed, the fee paid and all required information submitted. Editor's Note — The Application for Variance form is included as an attachment to this chapter. The Zoning Administrator shall then schedule a regular meeting of the Board of Adjustment and send copies of the application to Board members. Twenty (20) days before the Board meeting, an official notice to the public shall be published in a newspaper of general circulation in the City explaining the variance request and the time and place of the scheduled hearing. A copy of the notice shall be mailed to each party of interest and to the Planning Commission. Uniqueness. 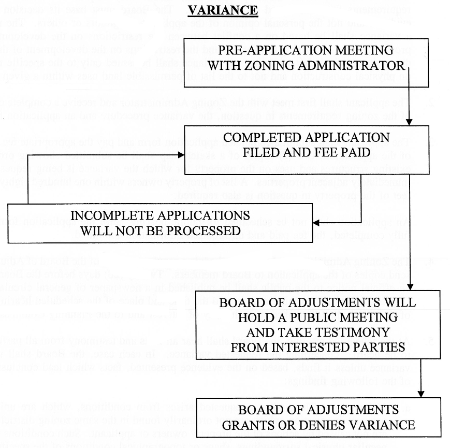 The variance requested arises from conditions, which are unique to the property in question, which are not ordinarily found in the same zoning district and which are not caused by actions of the property owners or applicant. Such conditions include the peculiar physical surroundings, shape or topographical conditions of the specific property involved which would result in a practical difficulty or unnecessary hardship for the applicant, as distinguished from a mere inconvenience, if the requested variance was not granted. Adjacent property. The granting of the variance will not be materially detrimental or adversely affect the rights of adjacent property owners or residents. Hardship. The strict application of the provisions of the zoning regulations from which a variance is requested will constitute an unnecessary hardship upon the applicant. Although the desire to increase the profitability of the property may be an indicator of hardship, it shall not be a sufficient reason by itself to justify the variance. Public interest. The variance desired will not adversely affect the public health, safety, morals, order, convenience or general welfare of the community. The proposed variance shall not impair an adequate supply of light or air to adjacent property, substantially increase the congestion in the public streets, increase the danger of fire, endanger the public safety or substantially diminish or impair property values within the neighborhood. Spirit and intent. Granting the requested variance will not be opposed to the general spirit and intent of the zoning regulations. 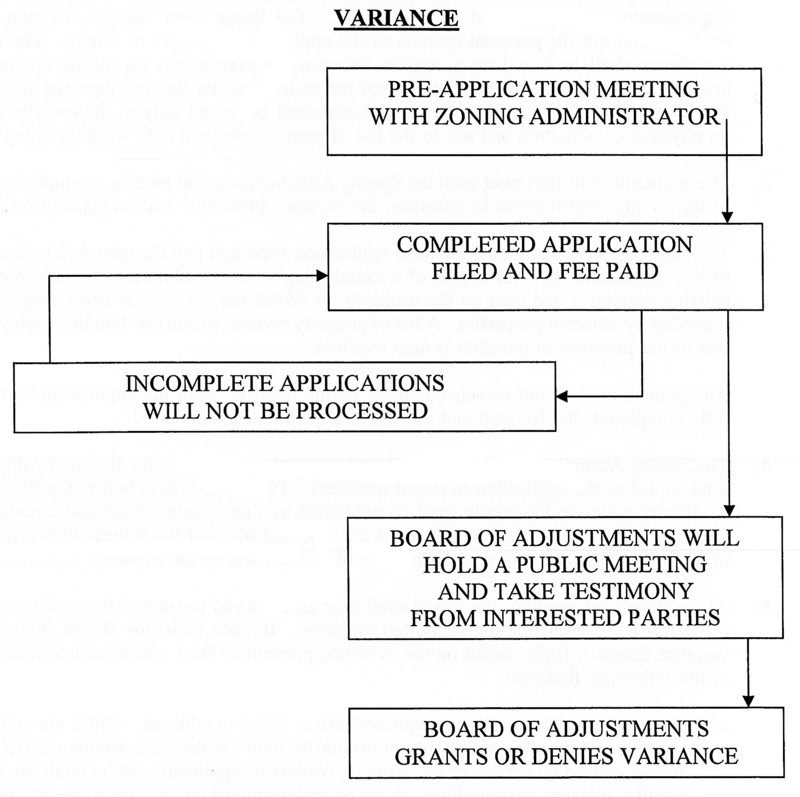 The Board of Adjustment may grant, grant conditionally or deny the application for a variance. In order to grant a variance, at least four (4) of the five (5) Board members must vote for the variance. The Board's determination, in writing, shall be sent to all affected parties including the Planning Commission. The Planning and Zoning Department shall keep minutes of the public meeting including evidence during the proceedings and the findings of the Board. Editor's Note — The Variance Determination form is included as an attachment to this chapter. Certain uses or exceptions are specifically permitted in particular zoning districts, but only when a special use permit has been obtained from the Board of Adjustment. These uses require special study with respect to specific location and design considerations to assure that they will have minimal negative impact on surrounding properties. The applicant shall first (1st) meet with the Zoning Administrator and receive a full explanation of the zoning and special use requirements and a special use application form. The applicant shall submit a completed application form and pay the appropriate fee. The application shall include a plan showing existing and proposed driveways and other information that would be helpful to the Board in their deliberations. The application shall include statements explaining how the proposed special use would accomplish the thirteen (13) objectives listed below. Editor's Note — The Application for Special Use form is included as an attachment to this chapter. An application shall not be processed unless it has been fully completed, the fee paid and all required information submitted. The Zoning Administrator shall then schedule a regular meeting of the Board of Adjustment and send copies of the application to Board members. Twenty (20) days before the Board meeting, an official notice to the public shall be published in a newspaper of general circulation in the City explaining the special use request and the time and place of the scheduled meeting. A copy of the notice shall be mailed to each party of interest and to the Planning Commission. The stability and integrity of the various zoning districts. Provision of adequate light and air. Prevention of overcrowding and excessive intensity of land use. Provision for public utilities and municipal services. Value, type and character of existing and proposed improvements and land uses. Consistency of improvements and land uses with community planning standards. Provision for orderly and proper urban renewal, development and growth. The Board of Adjustment may grant, grant conditionally or deny the application for a special use permit. In order to grant the special use permit, at least four (4) of the five (5) Board members must vote favorably on the request. The Board's determination, in writing, shall be sent to all affected parties including the Planning Commission. The Planning and Zoning Department shall keep minutes of the public meeting including evidence presented during the proceedings and the findings of the Board. To assure completion of conditions, the Board may require a performance bond. A time limit may be placed as a condition of approval to provide a periodic review of the special use. Editor's Note — The Reasons for Determination form is included as an attachment to this chapter.